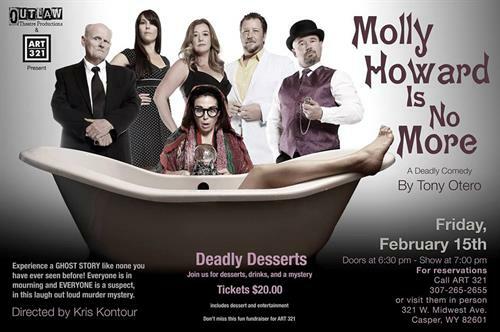 Friday, February 15, 2019 at 6:30 PM – 9:30 PM ART 321 is proud to partner with Outlaw Theatre Productions in a one night only “Deadly Des-serts” performance of Molly Howard Is No More, Friday, February 15th ! Bring your sweet-heart for a post Valentine’s Day date for desserts, drinks and mystery! The doors will open at 6:30 p.m. and the show begins at 7 p.m. Tickets are on sale now for only $20! To purchase tickets visit ART 321 in person or call for reservations 307-265-2655. The doors will open at 6:30 p.m. and the show begins at 7 p.m. Tickets are on sale now for only $20! To purchase tickets visit ART 321 in person or call for reservations 307-265-2655.